This is our opinionated soapbox on philanthropy, fundraising, the charitable sector and the world. For more information, visit GoalBusters.net or call 888.883.2690. 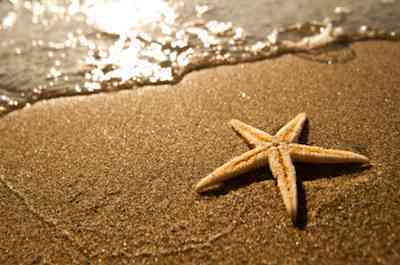 A man came across a child walking on the beach, upon which thousands of starfish had washed. The child was picking up the starfish that were still living, and throwing them back in the water, because if they stayed on the beach, the starfish would surely die. The man observed this for some time, and eventually approached. "I am saving the starfish," he replied. The boy bent down, picked up another starfish, and hurled it as far as he could into the ocean. Then he looked up at the man and replied, “Well, it mattered to that one." On a point of land, I found the star thrower...I spoke once, briefly. "I understand," I said. "Call me another thrower." Only then I allowed myself to think, he is not alone any longer. After us, there will be others....For a moment, we cast on an infinite beach together." So why is this story important to us? Jim and I frequently reflect on those rare people in our lives who are truly, deeply genuine. These are people who, regardless of what is happening to them, or to people they care about, or to situations around them, are true to their values, loyal to people who are important to them, and honest in what they say. These are not people who waver: they are our rocks, our foundation. Our star throwers. The star throwers of our lives tend to be underappreciated. They may be quieter than others, more introspective or introverted, yet they are always there, ready with a helping hand, a kind gesture, or an insightful observation. But it is one thing to tell people that you admire their traits. It's quite another thing to emulate them. Over the last several months, Jim and I have felt a need to express the values of GoalBusters more overtly. While we've never been shrinking violets about this (see the GoalBusters Manifesto), we also know that we need to clearly define where we stand. When we participated in the Women's March on Washington, we knew we were taking a step. Even though we work with many different organizations, with people of many perspectives, political beliefs and spiritual callings, they all have one thing in common--they are part of communities who struggle to have a voice. Whether it's a small public radio station covering border issues far from major cities, or a health care institution trying to provide comprehensive service in a rural community, or an education organization providing advancement opportunity to those who haven't had it before, these are charities that are, in many respects, trying to do the impossible. So, I dedicate the GoalBusters Manifesto 3.0 to our friends who are trying to do the impossible. To our Star Throwers. At GoalBusters, philanthropy, and fundraising, is not about money. Yes, money is involved, and we help our clients raise money and do more with the resources they have. But fundamentally, the obligation of the charitable sector is to make the world a better place, and to lift up the people and beings living in it. Fundraising is not about "shoveling coal into a machine." Your purpose has to matter to the communities you serve. You have to care about more than yourself. It comes down to the root of the word philanthropy: it means love of humankind. Therefore, we work with causes that we personally believe in. When we work with a client, we throw our hearts and souls into the organization. Ultimately, we can't fake that. Causes that we personally support include public and community media, education, healthcare for the underserved, diverse communities, arts and cultural programs, progressive causes, social justice, social services, and our professional associations. We also work with teams that are passionate--about the cause, about learning, about improving, about making the world a better place--because if you're not committed to your cause, why should anyone else be? Finally, we work with people who are committed to the highest standards of ethics and professional practice. And don't just give that lip service—actually live it. This post is dedicated to Vernon Kahe. Thanks also to our team, Annagreta Jacobson, Elta Foster, J.C. Patrick, Justin Anderson, Matthew Ferris and Dennis Gilliam for supporting and uplifting us every day, and to Bill and Matthew Ferris for allowing me to throw my whole self into GoalBusters. And of course, thanks to Jim Anderson for, well, everything. On March 7, 2007 (aka Liberation Day), Jim and I took a leap of faith that GoalBusters (founded as Ferris Consulting in March 2001) could be a real full-time gig, and now, ten years later, it is much more than that--it is our life's work. We have the privilege of meeting incredible fundraising professionals around the world and the honor of serving organizations that live the Manifesto. GoalBusters Consulting works with small to medium sized organizations looking for strategic planning, fundraising and marketing training, and outsourced development services. We work in public and community broadcasting, rural healthcare, education, and diverse communities, among other interests. copyright GoalBusters Consulting. Awesome Inc. theme. Powered by Blogger.